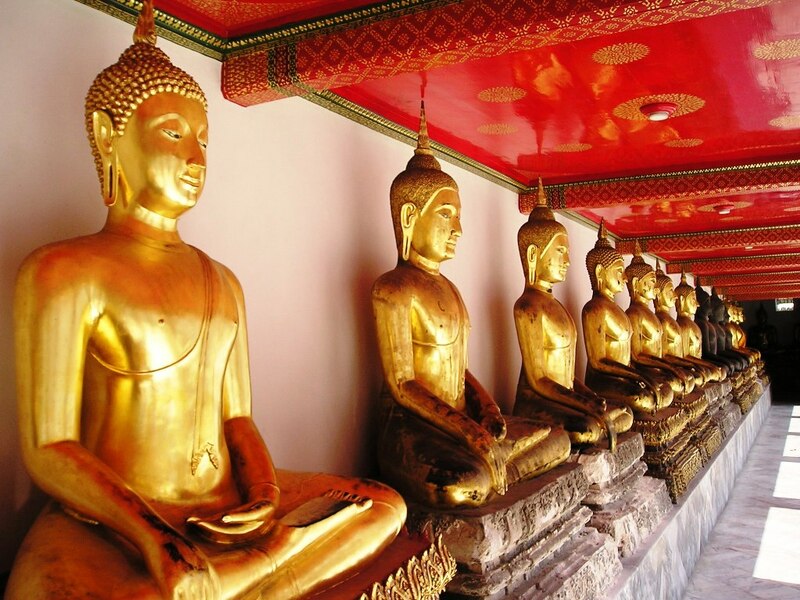 Bangkok is home to some of the most famous Buddhist temples in Thailand. 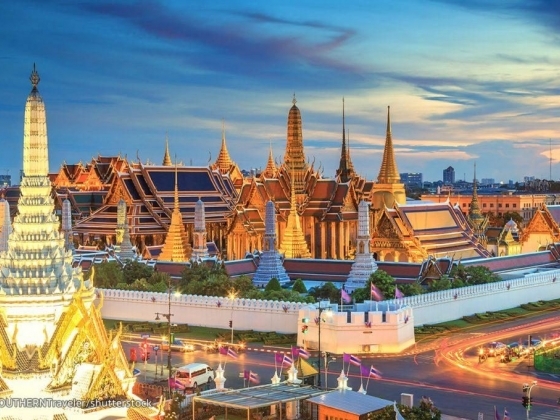 Every visitor to Bangkok should see some of the city’s stunning temples. 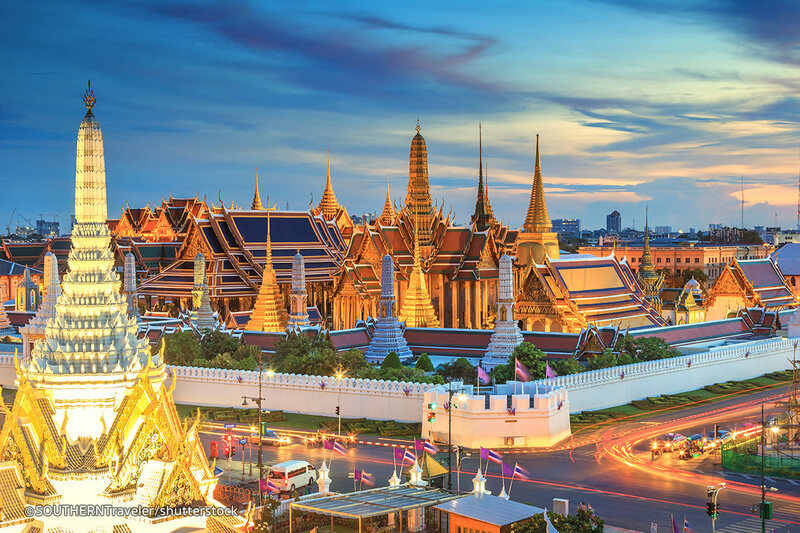 The most famous temples in Bangkok include Wat Phra Kaew, Wat Pho and Wat Arun. Wat Phra Kaew, the Temple of the Emerald Buddha, is located adjacent to the Grand Palace in Bangkok’s historical Old City and is one of the most important Buddhist temples in Bangkok. The temple was constructed in the 18th century and is best known for the Emerald Buddha, a statue that represents the Buddha in a meditating position and is carved from a single piece of jade. The statue is covered by a cloak that is changed by the King of Thailand three times a year. There are also several pagodas, statues and murals inside the temple grounds. Visitors dressed in shorts, sleeveless or revealing tops or short skirts are not allowed in. Shirts and long trousers can be hired for a small charge from a facility by the entrance. Personal Audio Guides are available in several languages. The Grand Palace and the Wat Phra Kaew are open daily between 8.30 am and 3.30 pm, and the Chao Phraya River Express boat service stops nearby at the Tha Chang Wang Luang Pier. Wat Pho is one of Bangkok’s largest Buddhist temples. The temple is home to the famous statue of the Reclining Buddha that is 46 metres long and 15 metres high and is covered in gold leaf. Wat Pho also has a traditional Thai massage school and a treatment centre in the premises. Ancient marble tablets around the temple grounds illustrate the principles behind traditional Thai massage and the traditional Thai medical system. English-speaking guides are available for guided tours around the temple. Wat Pho is located a short walk from the Grand Palace. 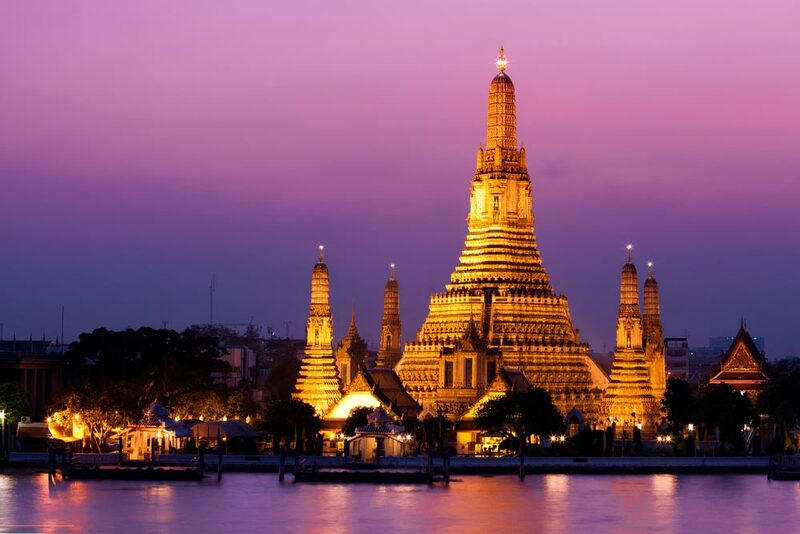 Wat Arun, the Temple of Dawn, stands on the west bank of Bangkok’s Chao Phraya River. Its central pagoda is 79 metres high, and it is visible from far away. Famous for its beautiful architecture and the intricate porcelain decorations on the walls of the pagoda, Wat Arun looks stunning in the morning around sunrise. Wat Arun is also known as Wat Chaeng. The temple is easy to get to by boat from the Tha Thien Pier (near Wat Pho) on the east bank of the Chao Phraya River. Buddhist temples are sacred places and temple visitors should dress respectfully. Shorts, short skirts or tank tops should be avoided. Some temples in Bangkok may refuse entrance to visitors who are dressed inappropriately. Shoes must be removed before entering temples. Feet should never be pointed towards an image of the Buddha. The best time to visit Bangkok’s temples is in the morning when the weather is not too hot. The morning is also a good time to witness the temples’ resident monks as they perform their daily routines. Many temples in Bangkok close their doors to visitors by 6.00 pm. Most temples charge an admission fee.